Eric La Casa is one of the most important sound artists of the past fifteen years in his line of work. 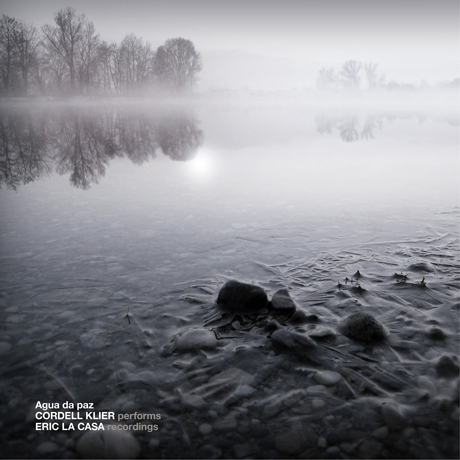 Cordell Klier who highly values La Casa's work used recordings made by him to compose "Água da paz" an incredible work with an organic formal structure and with deep emotional content and strong narrative textures. Most field recordists have experienced the moment when an unanticipated sound triggers compositional ideas. These moments serve as reminders to be flexible in our approach to recording and listening. This was the case for Cordell Klier in his latest release Agua da paz. While searching the internet Klier chanced upon a site featuring sound files of water recorded by Eric La Casa. Drawn to their emotional resonance Klier began to explore the different textures and tonalities of water. When Klier received further recordings from La Casa he created two deeply sensitive works collectively titled Água da paz. The first of these pieces, Água com tons, begins with a faint trickle of water. For a few minutes the water is barely distinguishable from the audience’s ambient background. This blurring of ambient and recorded boundaries allows the listener to engage in the compositional process, a technique slightly reminiscent of John Cage. A sudden introduction of multi-layered drips brings this experience to an abrupt halt, the water echoing as if recorded in a cave or another contained space. As deeper bubbling sounds transport us under water a discretely synthesised tone is introduced. This steady and meditative tone slowly changes pitch, contrasting with the erratic nature of the water. Klier’s approach towards La Casa’s recordings in Água com tons is suggestive of an inner dreamworld. Here the gradual fading in and out of La Casa’s recordings is more intent on altering the mind of the listener than exploring a known geographical space. Maneiras navegáveis continues this same approach. Again a faint trickle of water introduces the track, its fragile quality unexpectedly interrupted by an object thrashing loudly in a pool of water. Klier’s placement of these startling interludes serves a dual function. They demand the attention of the audience, insisting that their minds and ears remain sharp. More strategically they highlight the artifice in producing atmospheres through sound, with Klier intentionally compromising the worlds that he creates. As with the first track, Maneiras navegáveis juxtaposes sustained tones with multi-layered recordings of water, howeverin this track there is an unsettling sense of urgency that pervades the later half. Klier sustains our interest in Água da paz through a variety of techniques. Its central element, water, resonates with the audience at different emotional levels. By the end of the release Klier has taken us through moments of reflection, tension and relaxation. In Água da paz Klier removes La Casa’s field recordings from their original location and instead chooses to focus on the emotive qualities of water. In doing this Klier grants us the freedom to explore our own internal landscapes through the act of listening. It is with this approach that Agua da paz finds its success.